Our special edition P pod designed to celebrate the London 2012 Paralympics has found a new home. 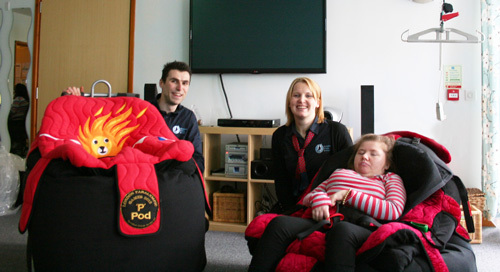 The Special Edition P Pod along with a larger version were donated on Thursday 13th February to a supported living service to help furnish their new sensory room. The home itself located in Cambridge is a supported living service for six adults with complex learning disabilities and very high health needs and has been running for nine years. On entering the home it was clear to see that it is ran by a friendly, enthusiastic and committed team. Everyone was thrilled to welcome the new additions and could not wait to get them open and try them out. The P pod definitely got the seal of approval from resident Charlotte as once she was sat in the P pod she fell straight to sleep – high praise indeed! Everyone was keen to show us the sensory room and talked through their fantastic ideas for the future. The Sensory room itself is due to be completed in 2 or 3 months and SOS have been invited back once the room is complete, so look out for an update on their progress. Jo Leggett, Locality Manager said, “The P Pod chairs are absolutely amazing and I don’t quite know how we can thank you enough. These chairs will massively increase the residents use of the sensory room once it is complete and the meaningful time that they can spend in the new room. 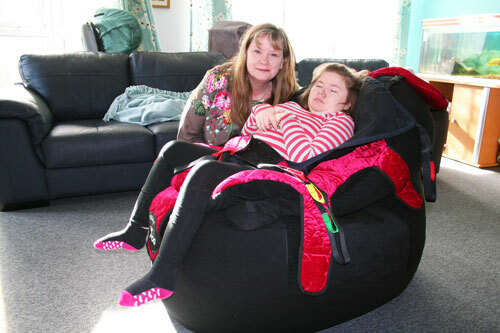 The parents of all the people we support would like to express the kindness that your team have shown to the people we support and feel very honoured and overwhelmed by the kind donation.” Pictured are Charlotte with mum Tracy and the new sensory room which is currently under development. Charlotte being hoisted into the larger of the two P Pods. Smiles all around as Charlotte falls to sleep in the new P Pod. 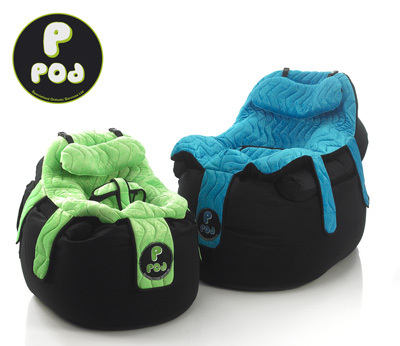 The P Pod is one of our most popular products. 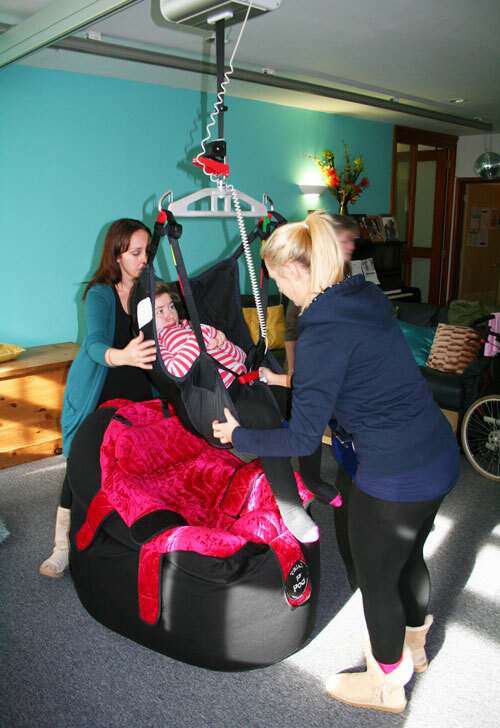 It offers a different seating experience for those with special seating needs for use by both disabled children and adults. 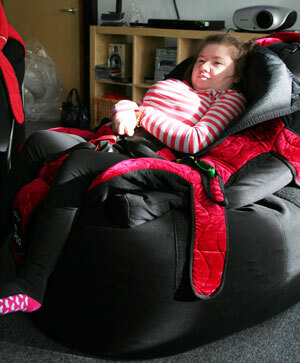 The unique patented design of the ‘P’ Pod combines a symmetrical or custom moulded support within the simplicity of a conventional Bean Bag base. Offering maximum comfort with postural support. Custom embroidery – The P Pod can be made absolutely unique by having a name, favorite band or football team name embroided on the badge at no extra cost. Mobile Base to allow the client to be moved from room to room without disturbance. If you would like more information or would like to book a demonstration please call us on 01283 812860 or email enquiries@specialorthotic.com.